It’s an innocent question. One that I rarely think about before I ask, whether presented to a restaurant server or posted online in a Facebook group. The answers we receive shape our own opinions, tweak our preferences and cement our decisions. When we ask other people for their recommendations or respond with our own preferences, we do so from a place of trust: trust between people, rather than the trust of an advertisement, spokesperson or brand. Millennials are leading the way for person-to-person recommendations. 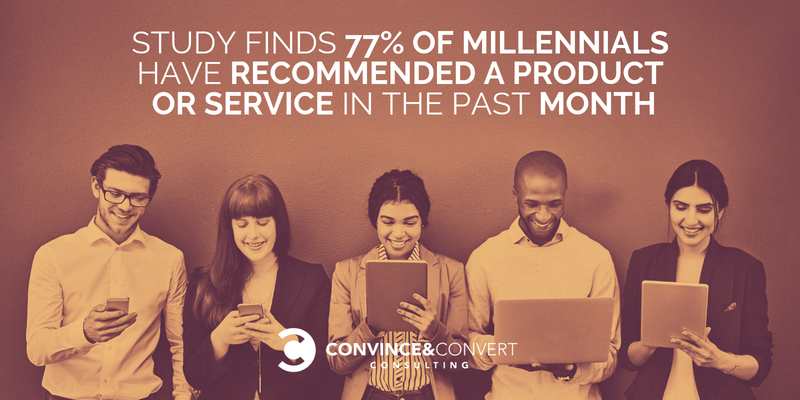 77% of all millennials have recommended a product or service to someone else in the past month. This data point doesn’t shock me, but the follow up does. 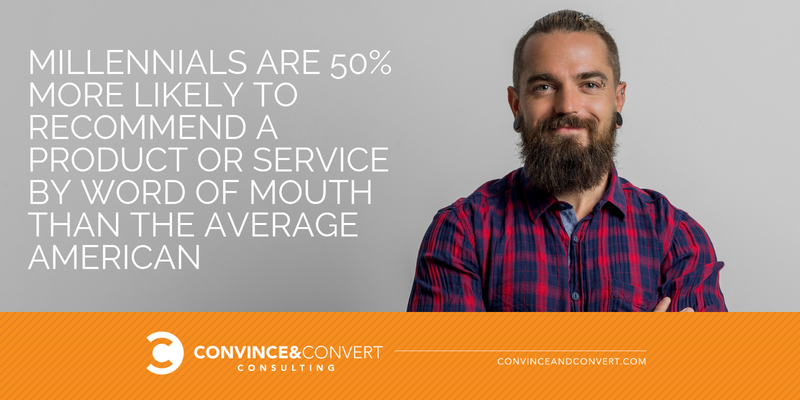 Millennials are 50% more likely to recommend a product or service by word of mouth than the average American. Say what? Millennials make more recommendations than any other demographic group, by far. Word of mouth recommendations are commonplace habits for the generation that could be called the “Google Generation.” Millennials learned very quickly the answer to any question lies just beyond the search box—and a recommendation for almost anything is as close as one text message or Facebook post. This is just one finding from our 2018 word-of-mouth report, Chatter Matters. In the report, we looked at the importance of word-of-mouth across variables, such as gender, age and online versus offline. While word-of-mouth affects everyone, it doesn’t do so equally or evenly. Word of mouth occurs so frequently on Facebook that the engineers recently optimized a posting option to make it easier to ask for and answer recommendations. Every day, millennials make recommendations on social media posts, Foursquare, and Google Reviews. Millennials save lists of favorite products on their phones and create “travel guides” for friends who visit their favorite cities. Why are millennials more prone to word of mouth recommendations for products and services than any other American demographic group? Simply put: millennials are in their prime decision-making stages of life. As a whole, millennials are more comfortable with groupthink and are more open to feedback. I expect that upcoming generations (Gen Z) will naturally follow suit with giving and receiving recommendations for products and services, as their own needs require informed decisions. 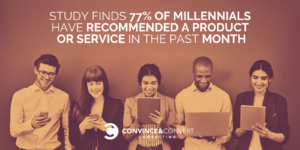 Millennials and Gen Zers are so wired to help, to earn and build trust, that they are also more likely to recommend a product or service based on what they’ve heard from others, rather than their own experiences. Passive word of mouth, whether identified as such (“I’ve heard, I read…”) is fascinating. A millennial myself, I audited my own recommendations in a single day—how I give them and ask for them myself. On Facebook alone, I made (at least) six recommendations in a single day. I recommended my family’s photographer, my kids’ preschool and my acupuncturist to a new mom in our local community group. To a pregnant friend, I recommended the vitamins that took away my first-trimester nausea. In a social media group, I shared which portable ring light I like best, and weighed in on the Hello Fresh vs. Blue Apron vs. Freshly debate that was raging in my News Feed. Ordering lunch that same day, I chose a salad with broiled goat cheese and poached pears. The reaction from my server was immediate: an emphatic head nod that validated my choice. He made sure to compliment my selection as one of his favorite things on the menu. Word of mouth is so ingrained in society; it comes even when we don’t explicitly ask for a recommendation. Chatter Matters is a proprietary word-of-mouth report produced by Convince & Convert Consulting and the research firm, Audience Audit. It examines the word-of-mouth attitudes of 1,001 randomly selected Americans. The margin of error is approximately +/- 3.1%. Chatter Matters is a companion piece to Jay Baer and Daniel Lemin’s new book, Talk Triggers: The Complete Guide to Creating Customers with Word-of-Mouth. It will be released by Penguin Portfolio on October 3.